Company looking to return to LeMans. David Brabham shows off his company's first racer, the BT62, in Australia. The name Brabham connotes speed and that moniker is back in the manufacturing business with the new Brabham BT62, a track-only speedster unveiled in Australia. The Brabham BT62 continues the ‘BT’ naming convention established by Jack Brabham and Ron Tauranac in the 1960s and honors the legacy of the marque’s greatest and most memorable cars, which includes 35 Formula One victories. The newest model is spearheaded by Jack Brabham’s son, David, who is the managing director at Brabham Automotive. The limited production racer can be had for $1.35 million. “It’s with great pride that I honor and continue my father’s legacy in revealing the next chapter in the evolving Brabham story,” he said in a statement. Brabham Automotive took the cover off its new racer, the BT62, producing 700 bhp. The BT62 is designed to honor the company’s famous designs of the past while acting as the building block for a new beginning. Crafted from lightweight carbon fiber, the BT62’s exterior surface and aggressive aerodynamic package combine to strike the optimal balance between function and form. 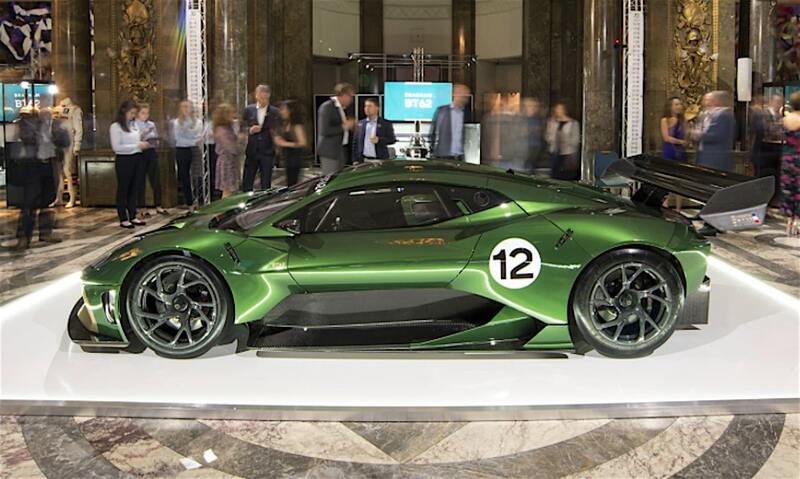 The new Brabham is pure-bred for the track and capable of setting blistering lap times, boasting a power-to-weight ratio of 730ps per ton and a dry weight of just 972kg. It is powered by a Brabham naturally aspirated 5.4-liter capacity V8 engine producing 700bhp and 492 ft-lb of torque. The BT62 is a limited edition speedster with just 70 being produced. Saving additional weight and with additive performance, brakes are carbon/carbon featuring six piston calipers front and rear. The new Brabham BT62 comes with Michelin racing slick tires. Michelin is the official tire supplier and technical partner to Brabham Automotive. 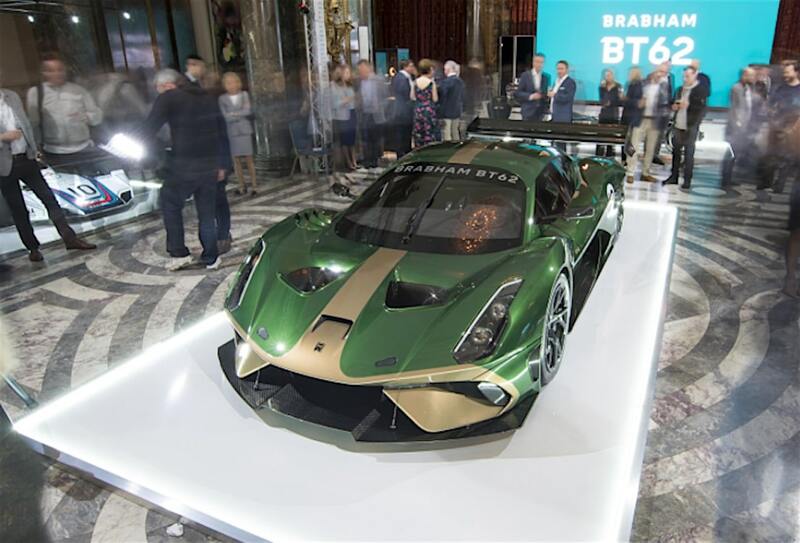 Production of the Brabham BT62 will be limited to just 70 cars to celebrate the 70 years since Sir Jack Brabham launched his racing career in Australia in 1948 and the birth of Brabham Automotive in 2018. The first 35 cars will be liveried in tribute to each of Brabham’s 35 Formula 1 Grand Prix victories. Owners of the Brabham BT62 will join a tailored driver development and experience program that will teach them how to fully exploit the performance potential of this car. First deliveries are expected later this year. The newly started company isn’t just creating high-priced racers for monied enthusiasts, according to David Brabham. 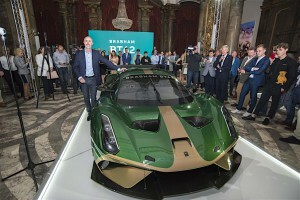 The clean-sheet approach to the new BT62 will eventually be applied to a vehicle that will bring Brabham Automotive to the 24 Hours of LeMans. This entry was posted on Friday, May 4th, 2018 at and is filed under Automakers, Automobiles, Business, Markets, Personalities, Racers, Super Cars. You can follow any responses to this entry through the RSS 2.0 feed. Both comments and pings are currently closed.